This is a Chinese name; the family name is Xiong. Xiong Zhaoren (Chinese :熊兆仁; February 1912 – 7 April 2019) was a Chinese Communist military officer who fought in the Chinese Civil War and the Second Sino-Japanese War. His role in the 1949 Yangtze River Crossing Campaign was adapted into the 1954 film Reconnaissance Across the Yangtze directed by Tang Xiaodan. He was awarded the rank of major general in 1955 and served as deputy chief of staff of the Fuzhou Military Region. He lived to the age of 107, the longest-lived founding general of the People's Republic of China. The Chinese Civil War was a war fought between the Kuomintang (KMT)-led government of the Republic of China and the Communist Party of China (CPC) lasting intermittently between 1927 and 1949. Although particular attention is paid to the four years of Chinese Communist Revolution from 1945 to 1949, the war actually started in August 1927, with the White Terror at the end of Generalissimo Chiang Kai-shek's Northern Expedition, and essentially ended when major hostilities between the two sides ceased in 1950. 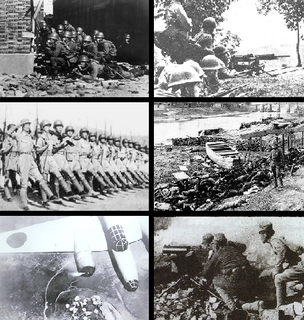 The conflict took place in two stages, the first between 1927 and 1937, and the second from 1946 to 1950; the Second Sino-Japanese War from 1937 to 1945 was an interlude in which the two sides were united against the forces of Japan. The Civil War marked a major turning point in modern Chinese history, with the Communists gaining control of mainland China and establishing the People's Republic of China (PRC) in 1949, forcing the Republic of China (ROC) to retreat to Taiwan. It resulted in a lasting political and military standoff between the two sides of the Taiwan Strait, with the ROC in Taiwan and the PRC in mainland China both officially claiming to be the legitimate government of all China. The Second Sino-Japanese War was a military conflict fought primarily between the Republic of China and the Empire of Japan from July 7, 1937, to September 2, 1945. It began with the Marco Polo Bridge Incident in 1937 in which a dispute between Japanese and Chinese troops escalated into a battle. Some sources in the modern People's Republic of China date the beginning of the war to the Japanese invasion of Manchuria in 1931. Yongding is a district under the jurisdiction of Longyan prefecture-level city in the southwest of Fujian Province, People's Republic of China. It is the home of many Hakka-speaking families. Yongding has a population of about 400,000, of which more than 99% are Hakka, the rest being Southern Min-speaking people. It was reported at the end of 2014 that Yongding had become a district, having previously been a county. Fujian, is a province on the southeast coast of mainland China. Fujian is bordered by Zhejiang to the north, Jiangxi to the west, Guangdong to the south, and the Taiwan Strait to the east. The name Fujian came from the combination of Fuzhou and Jianzhou, two cities in Fujian, during the Tang dynasty. While its population is chiefly of Han origin, it is one of the most culturally and linguistically diverse provinces in China. The Republic of China (ROC) controlled the Chinese mainland between 1912 and 1949. It was established in January 1912 after the Xinhai Revolution, which overthrew the Qing dynasty, the last imperial dynasty of China. Its government moved to Taipei in December 1949 due to the Kuomintang's defeat in the Chinese Civil War. The Republic's first president, Sun Yat-sen, served only briefly before handing over the position to Yuan Shikai, leader of the Beiyang Army. His party, then led by Song Jiaoren, won the parliamentary election held in December 1912. Song Jiaoren was assassinated shortly after and the Beiyang Army led by Yuan Shikai maintained full control of the Beiyang government. Between late 1915 and early 1916, Yuan Shikai tried to reinstate the monarchy before abdicating due to popular unrest. After Yuan Shikai's death in 1916, members of cliques in the Beiyang Army claimed their autonomy and clashed with each other. During this period, the authority of the Beiyang government was weakened by a restoration of the Qing dynasty. The New Fourth Army was a unit of the National Revolutionary Army of the Republic of China established in 1937. In contrast to most of the National Revolutionary Army, it was controlled by the Communist Party of China and not by the ruling Kuomintang. The New Fourth Army and the Eighth Route Army were the two main communist forces from 1938. The New Fourth Army was active south of the Yangtze River, while the Eighth Route Army was based in Yan'an in the northwest. Jiangsu is an eastern-central coastal province of the People's Republic of China. It is one of the leading provinces in finance, education, technology, and tourism, with its capital in Nanjing. Jiangsu is the third smallest, but the fifth most populous and the most densely populated of the 23 provinces of the People's Republic of China. Jiangsu has the highest GDP per capita of Chinese provinces and second-highest GDP of Chinese provinces, after Guangdong. Jiangsu borders Shandong in the north, Anhui to the west, and Zhejiang and Shanghai to the south. Jiangsu has a coastline of over 1,000 kilometres (620 mi) along the Yellow Sea, and the Yangtze River passes through the southern part of the province. The surrender of Imperial Japan was announced on August 15 and formally signed on September 2, 1945, bringing the hostilities of World War II to a close. By the end of July 1945, the Imperial Japanese Navy (IJN) was incapable of conducting major operations and an Allied invasion of Japan was imminent. Together with the British Empire and China, the United States called for the unconditional surrender of the Japanese armed forces in the Potsdam Declaration on July 26, 1945—the alternative being "prompt and utter destruction". While publicly stating their intent to fight on to the bitter end, Japan's leaders were privately making entreaties to the still-neutral Soviet Union to mediate peace on terms more favorable to the Japanese. Meanwhile, the Soviets were preparing to attack Japanese forces in Manchuria and Korea in fulfillment of promises they had secretly made to the United States and the United Kingdom at the Tehran and Yalta Conferences. Anhui is a province of the People's Republic of China located in the eastern region of the country. The province is located across the basins of the Yangtze River and the Huai River, bordering Jiangsu to the east, Zhejiang to the southeast, Jiangxi to the south, Hubei to the southwest, Henan to the northwest, and Shandong for a short section in the north. The Yangtze River Crossing Campaign was a military campaign launched by the People's Liberation Army to cross the Yangtze River and capture Nanjing, the capital of the Nationalist government of the Kuomintang, in the final stage of the Chinese Civil War. The campaign began at night on 20 April, and lasted until 2 June 1949, concluding after the fall of Nanjing and Shanghai to the Communist forces. Major general is a military rank used in many countries. It is derived from the older rank of sergeant major general. The disappearance of the "sergeant" in the title explains the apparently confusing phenomenon whereby a lieutenant general outranks a major general while a major outranks a lieutenant. The Cultural Revolution, formally the Great Proletarian Cultural Revolution, was a sociopolitical movement in China from 1966 until 1976. 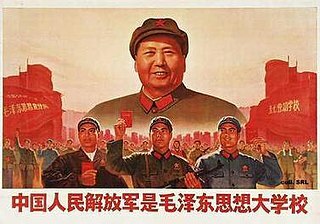 Launched by Mao Zedong, then Chairman of the Communist Party of China, its stated goal was to preserve Chinese Communism by purging remnants of capitalist and traditional elements from Chinese society, and to re-impose Mao Zedong Thought as the dominant ideology within the Party. The Revolution marked Mao's return to a position of power after the failures of his Great Leap Forward. The movement paralyzed China politically and negatively affected both the economy and society of the country to a significant degree. Meizhou is a prefecture-level city in eastern Guangdong province, China. It has an area of 15,864.51 km2 (6,125.32 sq mi), and a population of 4.33 million at the 2010 census. It comprises Meijiang District, Meixian District, Xingning City and five counties. Its built-up or metro area made up of two districts was home to 935,516 inhabitants at the 2010 census. The Ganzhou–Longyan railway is a railway connecting Jiangxi and Fujian Province in southeastern China. The line, also known as the Ganlong railway, is named after its two terminal cities Ganzhou and Longyan, and has a total length of 290.1 km (180.3 mi). Construction began on December 8, 2001, and the line entered operation on October 1, 2005. Major cities and towns along route include Ganzhou, Gan County, Yudu County, Huichang, Ruijin in Jiangxi and Changting County, Liancheng County, Shanghang, and Longyan in Fujian. Chu was a hegemonic, Zhou dynasty era state. From King Wu of Chu in the early 8th century BCE, the rulers of Chu declared themselves kings on an equal footing with the Zhou kings. Though initially inconsequential, removed to the south of the Zhou heartland and practising differing customs, Chu began a series of administrative reforms, becoming a successful expansionist state during the Spring and Autumn period. 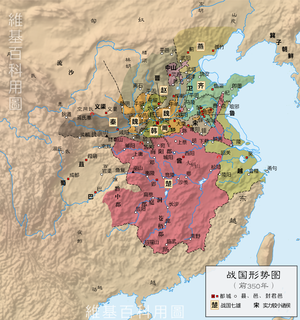 With its continued expansion Chu became a great Warring States period power, until it was overthrown by the Qin in 223 BCE. Xiong Guangkai is a retired Chinese general. He joined the army in 1956 and the Chinese Communist Party in 1959. 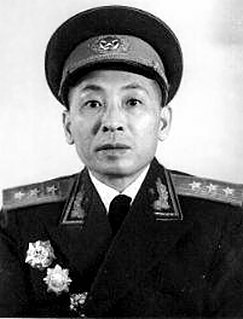 Xiong was Deputy Director (1984–88) and later Director (1988–92) of the People's Liberation Army General Staff Intelligence Department, Assistant (1992–96) and later Deputy Chief-of Staff (1996–2005). In 1988 he was conferred the rank of Major General, in 1994 Lieutenant General and in 2000 General. Han Xianchu was a general of the Chinese Communist Party. Han participated in many military campaigns and battles such as Battle of Pingxingguan, Liaoshen Campaign, Pingjin Campaign, Hainan Campaign, and the Korean War. In 1955 he was among the first group of military leaders to be awarded the Shang Jiang rank. The Battle of Siping (四平战斗), also called the Battle to Liberate Siping (四平解放战) by the Communists, was a battle fought between the Communist Forces and the Nationalist Forces in Jilin, China for the control of Siping during the Chinese Civil War. It took place immediately after the Red Army withdrew from Siping in March 1946, and resulted in a Communist victory. The Viceroy of Liangjiang or Viceroy of the Two Jiangs, fully referred to in Chinese as the Governor-General of the Two Yangtze Provinces and Surrounding Areas Overseeing Military Affairs, Provisions and Funds, Manager of Waterways, Director of Civil Affairs, was one of eight regional Viceroys in China proper during the Qing dynasty. The Viceroy of Liangjiang had jurisdiction over Jiangsu, Jiangxi and Anhui provinces. Because Jiangsu and Anhui were previously part of a single province, Jiangnan, they were thus known, along with Jiangxi, as the two jiangs, hence the name "Liangjiang". Wang Sanyun is a former Chinese politician. He began his political career in Guizhou province, before serving in Sichuan, Fujian, and Anhui provinces. He served as Anhui governor between 2007 and 2011, and was transferred to Gansu to serve as Communist Party Secretary between 2011 and 2017. Shortly after leaving office, he was put under investigation for violating party discipline by the Central Commission for Discipline Inspection. Fang Fenghui is a former top general in the Chinese People's Liberation Army (PLA). He served as the Chief of Joint Staff and a member of the Central Military Commission. He was placed under investigation for corruption in 2017 and subsequently convicted. Tang Xiaodan was a Chinese film director. In 1984, he won the Golden Rooster Award for Best Director. Zhang Yunyi, was a Communist revolutionary and military strategist of the People’s Republic of China. Born in Wenchang, Hainan, he joined the Communist Party of China in 1926, and took part in the Northern Expedition, the Nanchang Uprising, the Baise Uprising, the Second Sino-Japanese War and the Chinese Civil War. Zhang held the posts of the army commander of the 7th Red Army, the assistant staff officer of the Military Commission of the Central Committee of the CPC, the commander of a military area, etc., and was named one of the ten Senior Generals in 1955. The Zhang Yunyi Memorial Hall is located in Wenchang, Hainan Province. Ye Fei was a Filipino-Chinese military general and politician of the People's Republic of China. Born Sixto Mercado Tiongco Yap in the Philippines to a Chinese father and a Filipina mother, he joined the Chinese Communist Party at a young age and fought many battles as a senior commander of the People's Liberation Army in the Chinese Civil War. At age 40, he was among the first PLA commanders to be awarded the rank of General by the newly established People's Republic of China and later served as Commander-in-Chief of the Chinese Navy. He also served in a number of civilian posts including Governor and Communist Party Chief of Fujian Province, and Minister of Transport. Zhao Zhengyong is a former politician of the People's Republic of China who served as Communist Party Secretary, Governor, and Congress Chairman of Shaanxi Province. After his retirement, he was placed under investigation for corruption. The 28th Group Army was an army corps of the Chinese People's Liberation Army that existed from 1949 to 1998. From 1952 to 1971, the 28th Army was based in Putian, Fujian and belonged to the Fujian Military Region. From 1971 to 1998, this army corps belonged to the Beijing Military Region and was based in Shanxi Province, initially in Houma and then in Datong. At the time of its dissolution in 1998, the 28th Army was composed of the 82nd, 83rd and 205th Infantry Divisions, the 7th Armored Division, an artillery brigade, an anti-aircraft brigade, an engineer regiment, a communication regiment and a reconnaissance battalion. The army corps’ unit ID number was 51366. Jiang Shan is a Chinese politician who spent most of his career in East China's Anhui province. As of April 2014 he was under investigation by the Communist Party's anti-corruption agency, and he was expelled from the party and removed from office in December 2014. Previously he served as the Communist Party Secretary of Chuzhou. Wang Jianping is a former general of the People's Liberation Army (PLA) of China. He served as Commander of the People's Armed Police and Deputy Chief of General Staff of the People's Liberation Army. He was dismissed in 2016 and placed under investigation for corruption. He was a member of the 18th Central Committee of the Communist Party of China. He Lifeng is a Chinese politician and the current Chairman of the National Development and Reform Commission (NDRC). Earlier in his career, he worked in Fujian province and Tianjin. He has held a number of significant posts, including party chief of Fuzhou, party chief of Xiamen, party chief of Binhai New Area, deputy party chief of Tianijn, Chairman of the Tianjin People's Political Consultative Conference, and, since 2014, a deputy director of the NDRC. Jiang Liyin is a Chinese Communist politician and revolutionary agitator, who was a prominent member of the Fujian provincial leadership during the Cultural Revolution. He was later disgraced and expelled from the Communist Party of China for his activities during the Cultural Revolution. Zhang Tingfa was a Chinese Communist revolutionary and a major general of the People's Liberation Army Air Force (PLAAF). He served as Political Commissar and Commander of the PLAAF, and was a member of the Central Military Commission (CMC). He also served two terms as a member of the CPC Politburo, before retiring in 1985. He fought in the Second Sino-Japanese War, the Chinese Civil War, and the Korean War, and commanded the Chinese Air Force during the Sino-Vietnamese War. Over one hundred officials of provincial-ministerial level and above have been implicated by the anti-corruption campaign in China, which began after the 18th Party Congress in 2012. The number of officials implicated below the provincial level are much higher. The tables on this list includes only officials for which a case has been initiated by the Central Commission for Discipline Inspection. 1 2 3 4 5 6 7 8 Yue, Huairang (2019-04-08). "开国少将熊兆仁逝世，所部英勇事迹被拍成《渡江侦察记》". The Paper. Retrieved 2019-04-12. 1 2 Bartke, Wolfgang (2012). Who was Who in the People's Republic of China. Walter de Gruyter. p. 537. ISBN 978-3-11-096823-1. ↑ "《渡江侦察记》原型人物开国少将熊兆仁逝世". Sina. 2019-04-09. Retrieved 2019-04-12. 1 2 Xiao, Zhiwei; Zhang, Yingjin (2002). Encyclopedia of Chinese Film. Routledge. pp. 501–2. ISBN 978-1-134-74553-1.